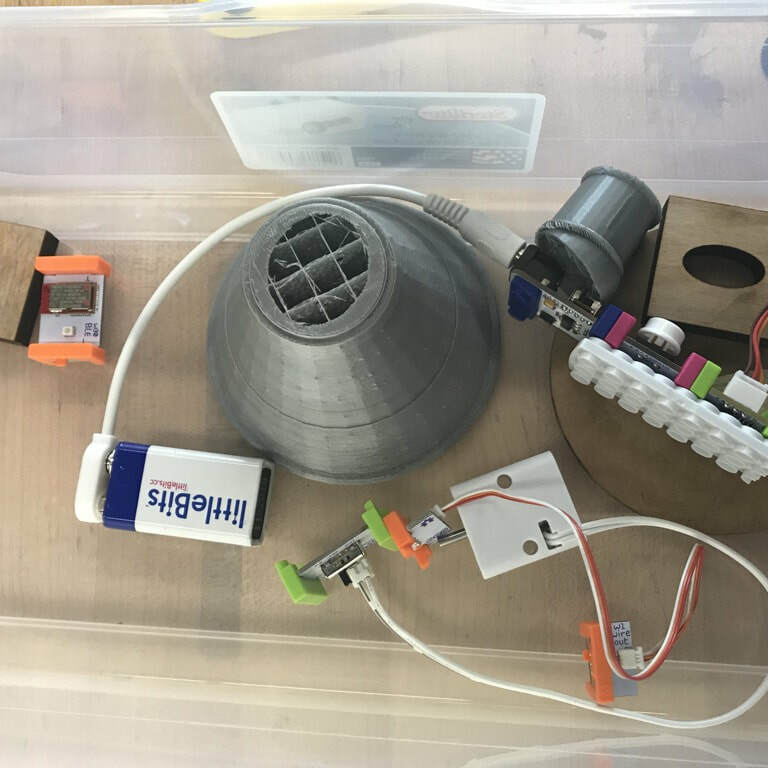 This week we had the Community Forum, an event like a science fair where we got to show the community are product and our project as a whole. We all had a great time sharing our product and people really enjoyed learning about our project too. It was a great wrap up to a project a long time in the making. We presented multiple things to the community. First, we talked about what the problem we were trying to solve was, what our solution was, etc then we showed them our physical prototype and our app. We had our shower head attachment out for people to look at and “Try out”— (they didn’t actually shower with it but they got to see how it works). We had to make sure that everything was working and ready to present. We also showed people our app. We all got the app on our phones so we could present it to them. We also had two iPads out on our desk — one had our app open. People could explore around the app. The second iPad had a QR code that people could download the app with on their own, personal devices. Our prototype posed an issue two days before the forum. It wasn’t turning properly, and therefore not working. We struggled to find a quick solution that would ensure success. We ended up re-engineering our contraption so that it didn’t involve a moving string. This allowed us to more efficiently get our contraption working. Once it was working we all felt more confident about the forum. We all learned important lessons on presenting, and how to keep someone involved. When a person would come to our stand we learned how to explain our project. It really helped to use our prototype to give our viewers a real “hands on” approach. It was hard at first to give our presentation but eventually we all caught on. The CBL forum was an amazing experience that changed all of our lives for the better. We gained entrepreneurial knowledge that allows us to pitch a project. We all learned a little bit about teamwork, app building, and robotics. We want to especially thank Kevin Kloeker for giving us this opportunity to grow as students, and innovators. We are coming to the end of this project! But, we have a few more details to update you on. Our final product is to make an attachment for any shower head. These attachments make the showers more eco friendly by stopping them, and turning them off completely, after a certain number of time. You will be able to control this time on an app. The app has several components. The app has a section where you type in the length you want your shower to be, it gives you the numbers of how much water you used, how much water you saved compared to the average shower, etc., and the final part of the app is a part where people can win prizes/be on a leaderboard based off water they saved. But, why would you buy our product and control the time of your shower when you can just shut it off yourself? Well, it turns out that because people love to be in the shower. Our product makes sure that the water gets off so we can keep our planet green. We took lots of data from people to figure out if our product would work. We asked people two questions. First, we asked them what is an Eco friendly shower to you where you don’t feel rushed and what is the length of that shower. And then we asked them what is the length of their average shower. Our data from these interviews taught us that if people took an eco friendly shower to them they would save a lot less water. But, they won’t do that because there is nothing to stop them from staying in the shower for a long time. But, our product will make them get out after the amount of time they think is an eco friendly shower because the water turns off. Something we could have changed was to have questioned more companies for information. Even though we called a few we believe that we could have gathered more information if we did more phone calls. Something to increase our impact and which would have really helped us would have been to do a school wide form instead of going around campus and asking people. Even when we did this we still received some feedback of how long people took in the shower and how many gallons they used. In all, our group has been working very hard to build up our idea and we are almost done making our idea a reality. This week we have made a lot of progress since our last blog post. We have put together a basic prototype of our app and, we have built a prototype of our shower head attachment. Our valve, which is we are using in our attachment, was just delivered and we are trying to set it up with a pulley system to turn it. We faced a few problems while building these prototypes. We were trying to use little bits, which is small electrical parts that you can use to make things move, flash lights, etc., to move the shower valve but the valve was too heavy so we are now building a pulley system, like we said before. We also faced a few problems while building our app. 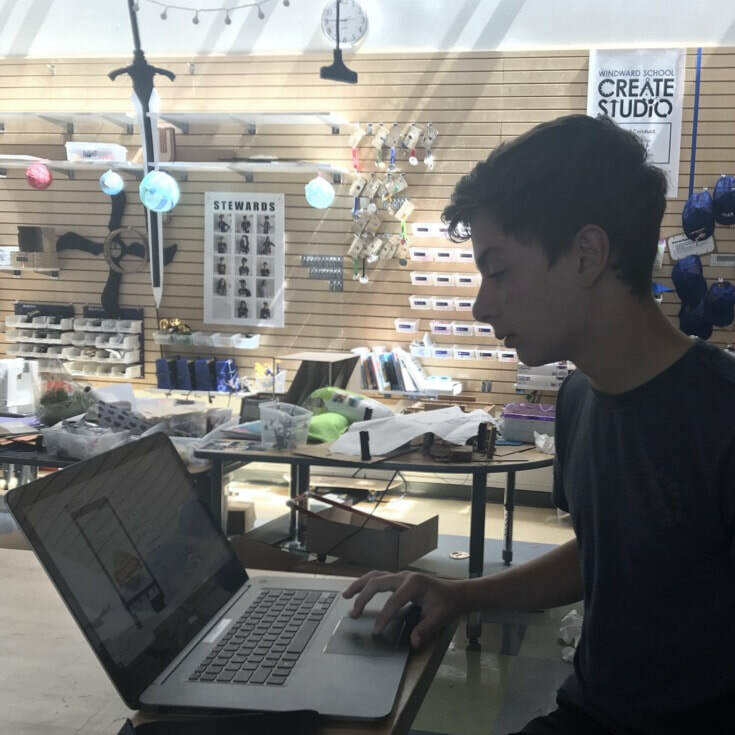 It wasn’t letting us add several components of the app we needed so we scheduled a meeting with an app designer, named James Bolanga, who will help us finish our app. By next week, our hope is that we will have a finished prototype of both our app and our shower head attachment. We are excited to be coming down the home stretch of this project! ​ This week was a good one for our team. We finalized our problem to people wasting water while showering. We landed on this specific problem because we learned that people taking showers that are too long adds up too wasting the the second most amount of munt of water in a household behind toilets. We thought that we could make the biggest impact on this because it would be the problem that we had the most and best ideas for. Our group came up with a ton of solutions this week but only a few made it through the final 3, that we were deciding between. The three solutions that we thought were the best was a shower head that is controlled by an app on your phone. You would put in the app the amount of time you want your shower to be and the shower head would turn off automatically after that period of time. Another solution we came up with also involved an app. The app would be able to calculate how much water you used in the shower. We would come up with some mathematical way to turn that amount of water into points which can be used for prizes for people to claim. The last solution we brainstormed was a waterproof shower calculator that showed how much water you wasted while in the shower. You could hang this on your shower wall. As we were researching solutions already in existence, we came across a product very similar to our first solution idea. Their product was a showerhead that after a certain amount of time, it cuts the flow of water coming from the showerhead by ⅓ of the original pressure. Our group was not fond of that shower head because we thought that not cutting of the flow of the showerhead completely was a mistake. Our idea for stopping water is having the shower head turn off completely and then if you still have not showered fully and you still have soap in your hair or on your body, you will be able to turn the shower head back on to wash it all off. We did not think that this solution that cut flow to ⅓ was successful because it did not seem to be a completely reliable website and when we went to the ordering page of the website, it said that it is unable to ship for 5 weeks which we thought meant that it is not working or people did not like the product. 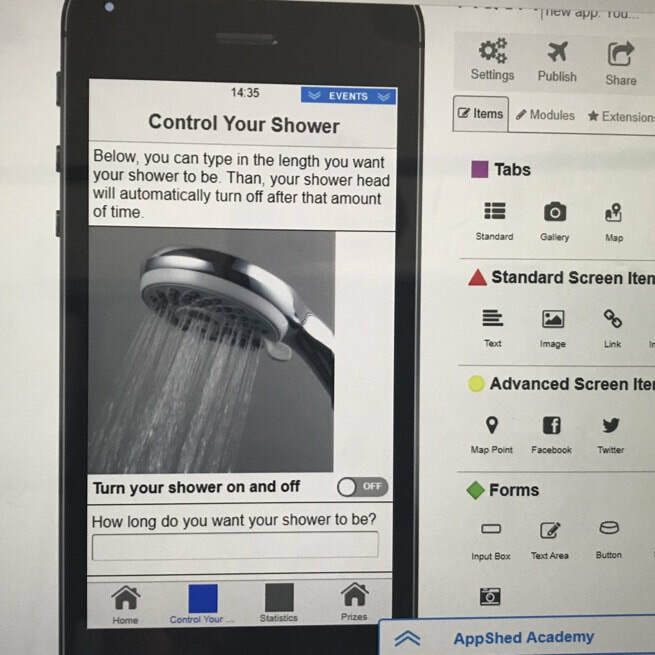 Our group decided to focus on the solution with the app that turns off the flow of water from the showerhead completely after a certain amount of time. This is because we thought that this is they way that we could make the biggest impact on the community. We have started a prototype of the shower head that we 3D printed. We are considering making an attachment, that would be connecting with the app through Bluetooth also, which can just be attached to your normal shower head. We will update when we have any more progress and hope that we will make a big impact on the community and to save a lot of water! We narrowed our topic all the way down to wasting water while showering. We have talked to people in our community, and we’ve all become more involved in helping to solve this problem. From our research, the main problem that we have learned about is that showering is one of the two main things that impact everyone’s water footprint. It takes up about 20% of our daily water use. The average shower in the US is 8.2 minutes long and you use 2.1 gallons of water per minute in the shower. 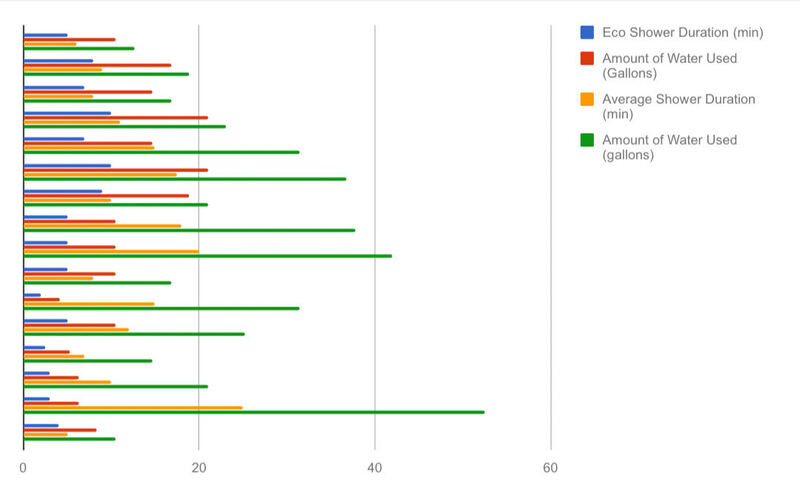 So, in an average shower you waste 17.22 gallons of water per shower. This proves how big of a problem this and how it needs to be fixed as soon as possible. We have reached out to multiple companies and organizations that know a lot about water conservation. 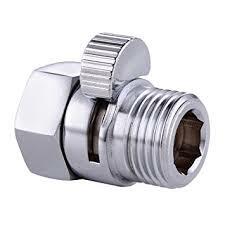 We’ve contactacted the Grace Communications Foundation and the Alliance for Water Efficiency. We contacted both of these organizations because after reading and taking notes on both of their websites, we realized that there was still more that we needed. Both of the organizations have given us a lot of information that show how much of a problem water waste while showering is. They both brought up the idea that you are wasting a lot of water while the shower is heating up because most people go and do something while the water is getting hot. Also, they said that people lose track of time in the shower which extends the time of the shower when you should really be getting in, doing whatever you need to do, and getting out. During our phone call with the Grace Communications Foundation, they said something that we found interesting. They said, “it’s impossible to have a 0 water footprint.” This big problem of water waste is never going to be totally solved because no matter what, we need to use water. That is the reason this is such a huge problem. But, what the Grace Communication Foundation said taught us something. Because this is such a big problem that will never be solved, we need to everything we can to limit the water we use in our everyday lives. The moment we found out that we were group members we knew that we were going to make a great team. 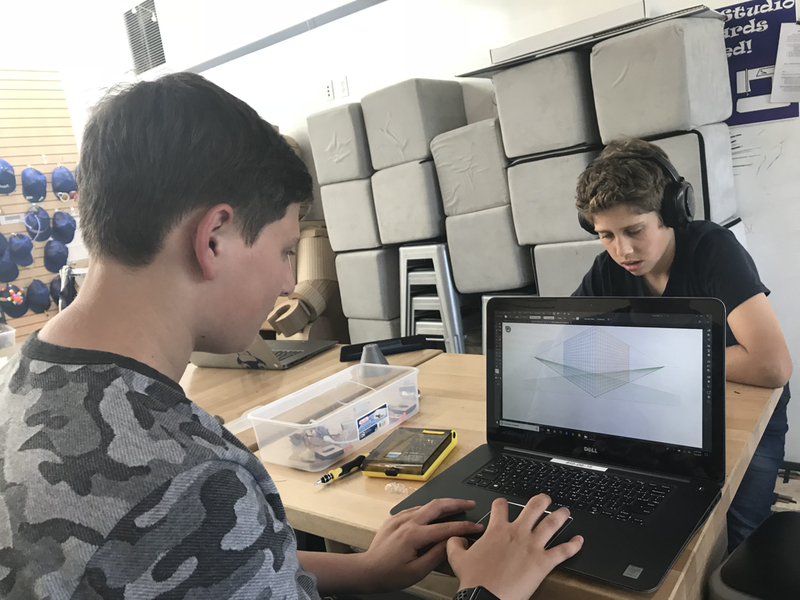 In the first few minutes of the project, we already had something in common - we all were inspired by and wanted to make our project about waste. As 7th graders at Windward School, we are excited to take on the challenge that is CBL. CBL stands for Challenge Based Learning. We are given two options about what to write about - either disaster relief or waste mitigation. But, as we said before, we decided on waste mitigation. Later in this project, we will find a problem related to water consumption and solve it. The reason we all wanted to do our project on waste mitigation is because we realized that we are wasting so much in our everyday lives. We will not only make a difference for the community, but we will make a difference in our own lives too. After a day of research we came to the subtopic of water waste. We are all invested, in making something happen, that will help reduce the amount of water we use everyday. We all think that this was the best way to impact the community, and we cannot wait to get started.